The intersection of Jewyness and Lego is pure win. Why? LEGO doesn’t “do” Jewish. By default, anything Jewy we make out of Lego is a hack, i.e. creative modification: two words that are so Lego to begin with. 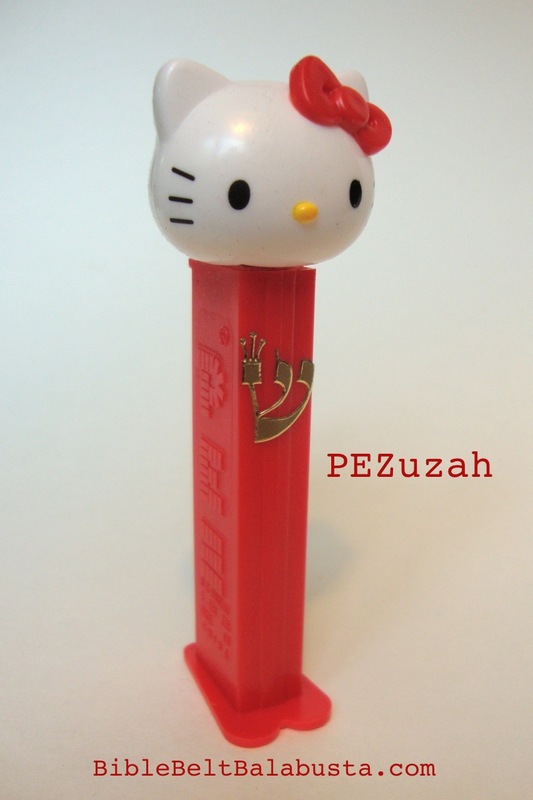 Add to this the gentle frisson of repurposing an iconic toy to represent components of our an-iconic religious tradition. 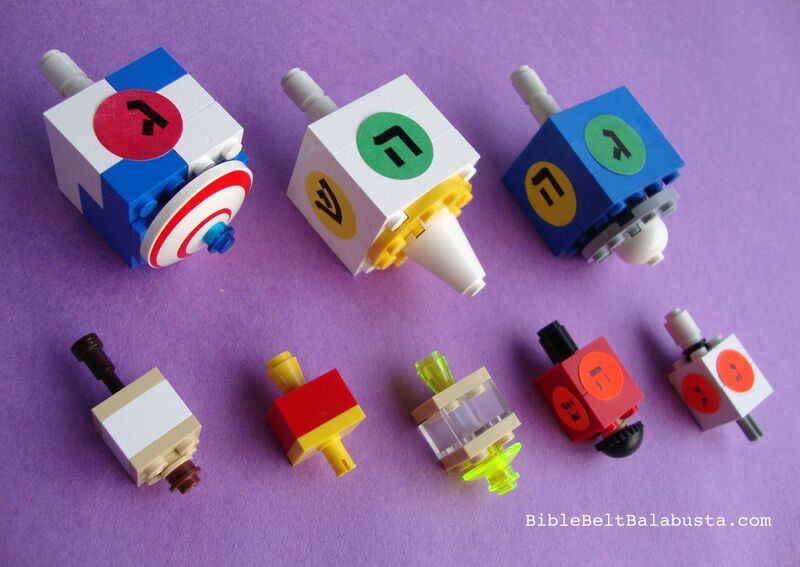 When we build Jewish Lego, we convert the world’s best construction toy to Judaism. Then, add the simple tactile pleasure of messing about with Lego, and the simple pleasure of inviting your kid to do the same. The real question to ask about Jewish Lego is not why, but why not? Lego makes me happy because I love to build, I love to build with my kids, I love to build things that make Jewish holidays more fun and hands-on, and I love that my core brick collection is from my own childhood, back when two big boxes from Service Merchandise appeared under the Christmas tree, circa 1974. This last reason indicates the source of that gentle frisson mentioned above. The irony is delicious, but the link to my childhood is still just that: a link, a bridge to who I was and who I am now. I’ve designed Lego mezuzahs, menorahs, dreidels, a Duplo Temple as a set to enact the Hanukkah story, and holiday vignettes galore, but I’ve only just begun. See some of them below. 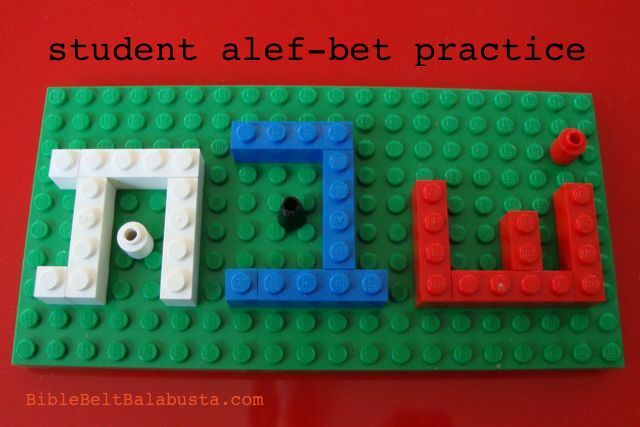 LEGO aleph bet and spelling. How about the rest of the world’s Jewish Lego efforts? So far, there is no site devoted to the building or the indexing of such. 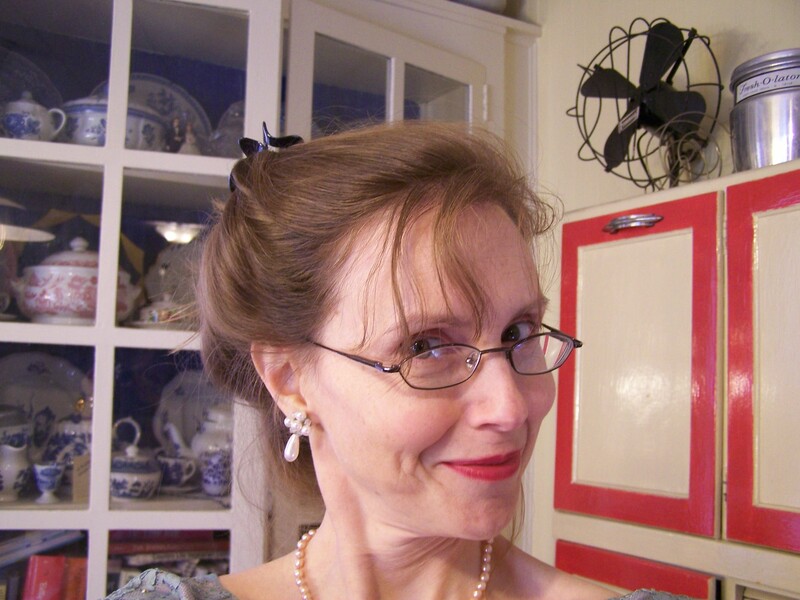 I’d love to see a snazzy photo blog that allowed users to upload pics. 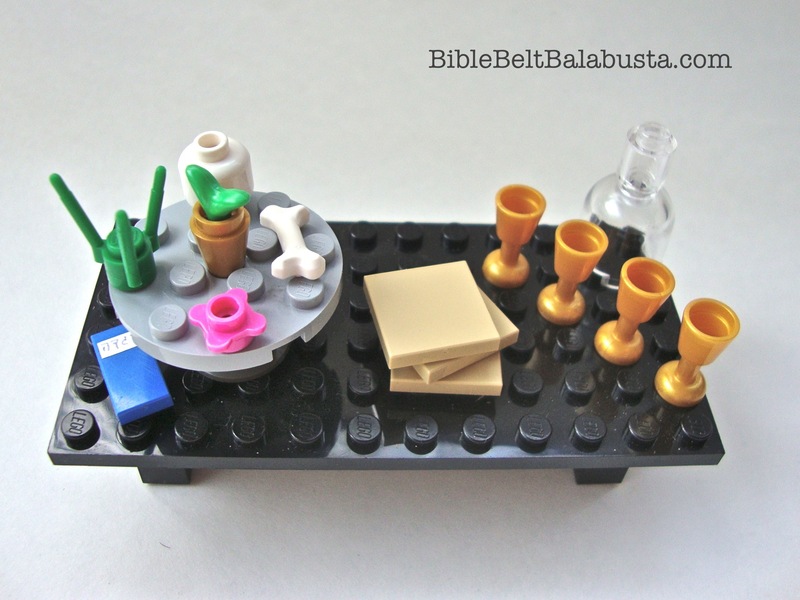 GodBricks does an amazing job keeping track of religious-themed Lego creations, but it encompasses all religions (even ancient ones!). Chabad deals with Lego at highly visible menorah builds and public menorah lightings. As befits talented missionaries, they know how to use irresistible materials as outreach. Various dedicated AFOL (adult fans of Lego) have made stop-action films with Lego minifigures re-enacting Jewish holidays, events and real films. 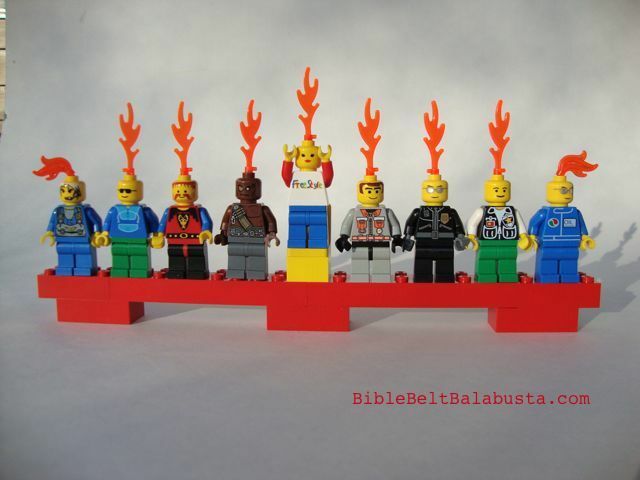 The Brick Bible interprets most of the “Old Testament” (not our term, y’all) in minifigs, which means the subject matter is arguably Jewish, but the authorship of this visual midrash—from a self-appointed atheist Reverend— ain’t. Here is a good time to mention that the definition of what makes any Jewish art “Jewish” is a topic of hot and ongoing debate. Is the 17 year-old who assembled the lovely Lego Solomon’s Temple Jewish? I don’t think so, but the Temple is, and maybe a brick version is, too. On a smaller scale, adults and kids make dreidels and menorahs out of Lego every year, as is proven by a quick online search. It makes sense that the most visible Jewish holiday is also the one most often kitted out with Lego. Here are links to some of my Lego work. The pictures aren’t fabulous, but I present them as inspiration for what you and your kid might create. I’ve also done some quickie vignettes so the minifigs can celebrate Jewish holidays. Type “Lego” in my Search Box in the sidebar anytime to find these and others. Sign up to get an email every time I post new material, and do consider liking my Facebook Page. Thank you for reading this far! I LOVE this post!! 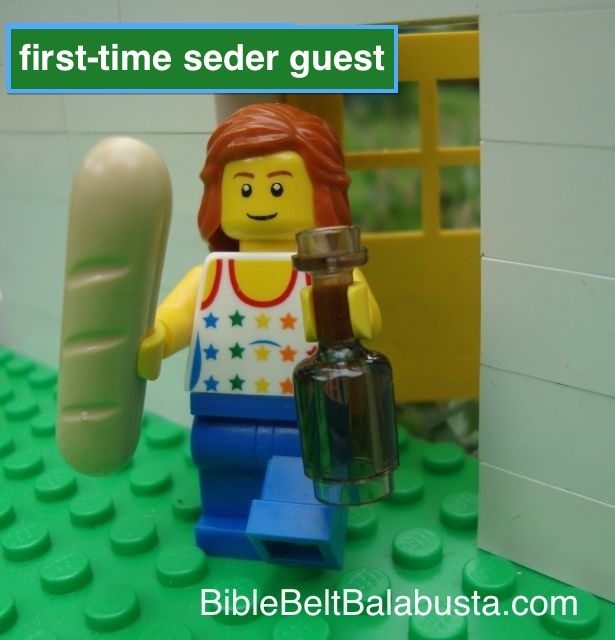 I wonder if I can use Legos with my Hebrew School class? I teach third graders during their first official year of instruction. Hmm…can we make letters out of the Legos? The Earth just moved. It was the meeting of like minds. Yes, absolutely to the teaching of letters and words with LEGO. Oh man, if you have a big box of assorted bricks, think of the creativity and leaps of imagination required to recreate letters, vowels, words incrementally. You just reminded me to post a picture of a student-made LEGO Hebrew exercise. Stay tuned, and thank you! This page was meant to be! And I’m speaking as someone coming from the same place and heading in the same direction, and quite possibly equipped with some very similar boxes of lego… 🙂 This should guarantee a lot of fun! I’m just thrilled we found each other, which is what it’s all about, really. So grateful. Thanks for the mention of my blog, GodBricks. 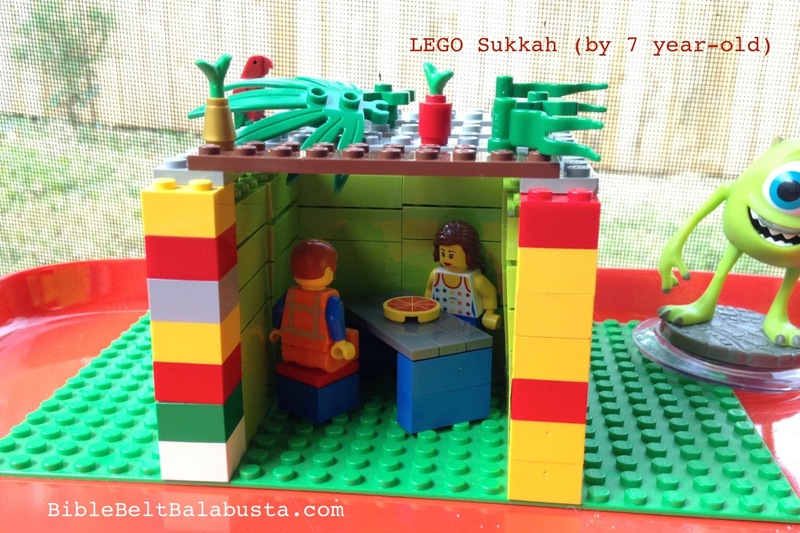 As you say, I’m not Jewish, but I hope I’m respectful of all of the different faith traditions celebrated in LEGO form on my blog. As you note, a lot of the “Jewish” LEGO creations out there are not necessarily by Jewish builders. For instance, I tag all creations related to the Hebrew Bible/Old Testament with “Judaism”, though many are probably built by Christians. The kid who built the huge version of Solomon’s Temple is a Protestant of some denomination, for instance. Brendan Powell Smith, who is behind the “Brick Testament”, is an outspoken atheist. BTW, you write how LEGO is not Jewish. Their total lack of religion is something I’ve written about a little on my blog. They have some vaguely religious references here and there, but have largely avoided this, presumably to avoid offending this or that segment of the buying public. I do wish they’d build some of the great religious structures of the world as part of their series of landmarks. For instance, there are large LEGO sets based on the Statue of Liberty and the Eiffel Tower – I’d love to see them also have things like Notre Dame, etc. 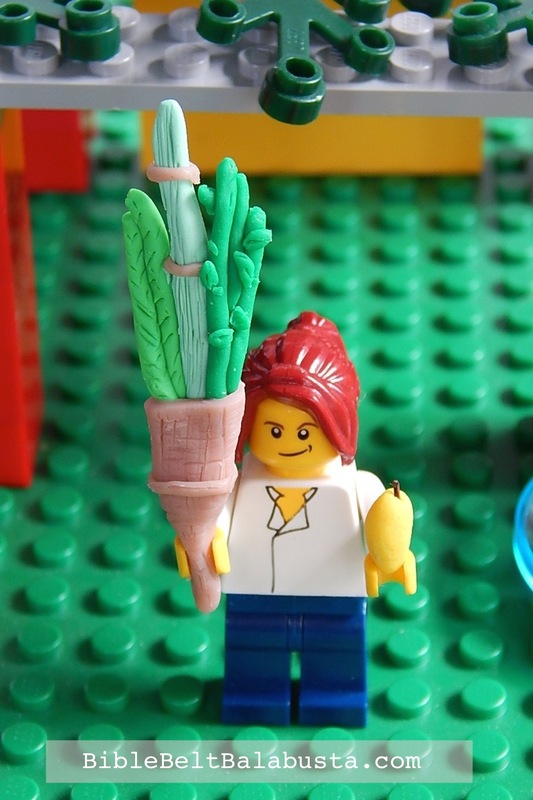 Anyway, I’m loving your blog and will feature more of your LEGO creations on mine as well. 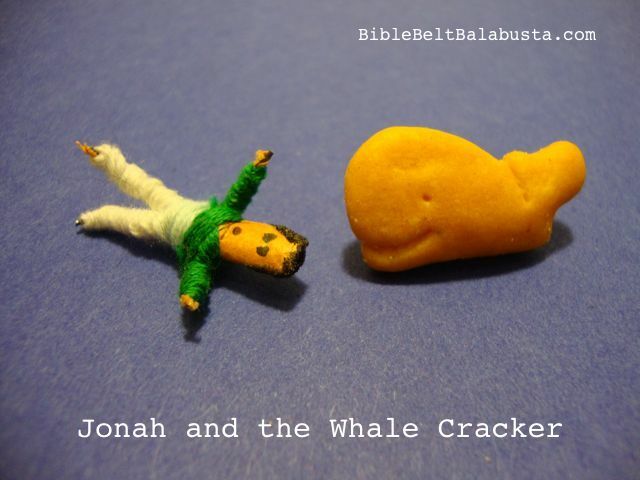 Your pics and commentary at GodBricks are a lesson in respect for “different faith traditions,” as are your essays. I wouldn’t be surprised if there was a Religious Studies major in your background, or a PhD in Comparative Religion. Or maybe you were just raised right. Or maybe you’re just a mensch. Regardless, GodBricks is awesome in scope, presentation and friendliness. Glad you inserted a link to your essay about official LEGO and religion. You’ve given religion/LEGO enterprises a lot of thought, and I’m still pondering your essay about motivations. It is weird that official LEGO won’t even touch religious structures so freighted in cultural/literary connections (like Notre Dame). But I suppose they’ll get a lot more customers with things like the new “Lady Lego” Friends stuff. More buyers want to pretend to get a manicure than to assemble rosary windows. Erg. Here is a LEGO Bat Mitzvah cake topper! Here is a LEGO Jewish Wedding Cake Topper! WHAT? Jenn, thank you for telling me this news. I’m checking it out right now. This will call for some retail research and review! You have some of the most inspiring homespun Judaica I have ever seen, mazel tov! 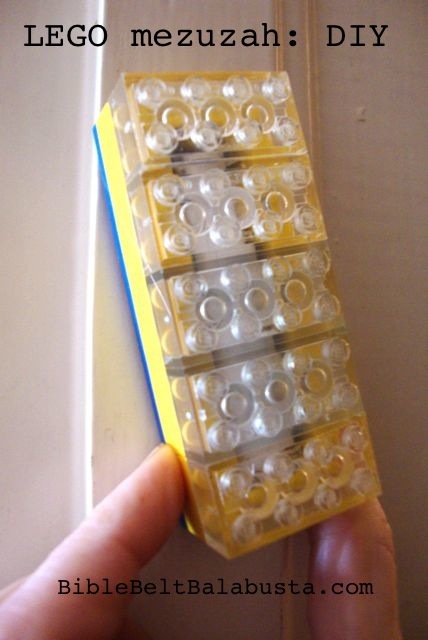 Where did you purchase the clear 2×4 Lego blocks in your photo of the Mezuzah that you made? I’ve got students who wish to make this their project this Sunday! Shelley, when I need specific parts I order from the vendors at BrickLink.com. You can search by part and your required quantity, and find the vendor closest to you or with best price, quickest shipping, etc. My clear bricks are ancient ones, but if you want to order them, try part #3001 in Transparent-Clear. Joanna, last year I was called upon by a local synagogue to produce a LEGO® dreidel kit for their LEGO® themed Hanukkah Festival. I searched online and found some designs, but most did not spin well. The small ones with the very pointy bottoms are difficult for little hands to use, as you noticed. The larger designs I found did not spin well either. I thought back to the dreidels I had as a child, and I realized that the handles on the LEGO® dreidels were wrong. 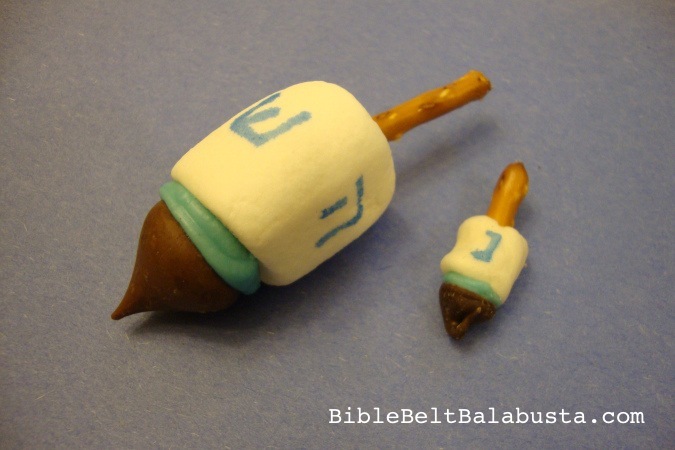 As you said, many, many years of experience have gone into making dreidels what they are today. It is all about weight and proportion. On some of the designs I found, the handles were too short, or they were made of 2×2 round bricks which were too wide and too heavy. The kit I created uses a Technic axle # 6, with a bushing and a smooth connector on the end of it for the handle. I tried putting the tiny pointed slopes on, but it was still too difficult to use, so I used the 1×1 round plate instead (which I previously posted on your blog). I have created a LEGO®-like instruction sheet in .bmp format, including a parts list and part numbers. I travel to various LEGO® conventions to display my MOCS (My Own Creations). I usually bring along some dreidels and the menorah I built as well. People will stay for several minutes spinning the dreidels–and not just the kids–and are always wanting to purchase them. This year, I have plans to actually light up the menorah. 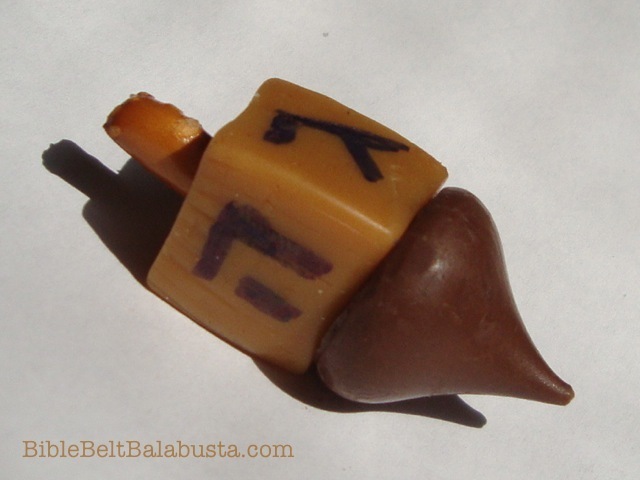 I am also in the process of putting together dreidel kits for sale, as the specialized pieces required are not in the average child’s toy box. The letters will already be on the parts, as well, with directions indicating the order in which they belong. I would be happy to send you photos of my dreidels and menorah to post on your page. Hi Joanna, I thought you’d like to know that my Hebrew school class built Lego aron hakodesh this week, complete with the two tablets inside. I had them try to follow directions for the specific measurements of cubits, gold coverings and the chereubs on top. The kids loved it. Leanne, how wonderful!! I love this! Thanks for letting me know. 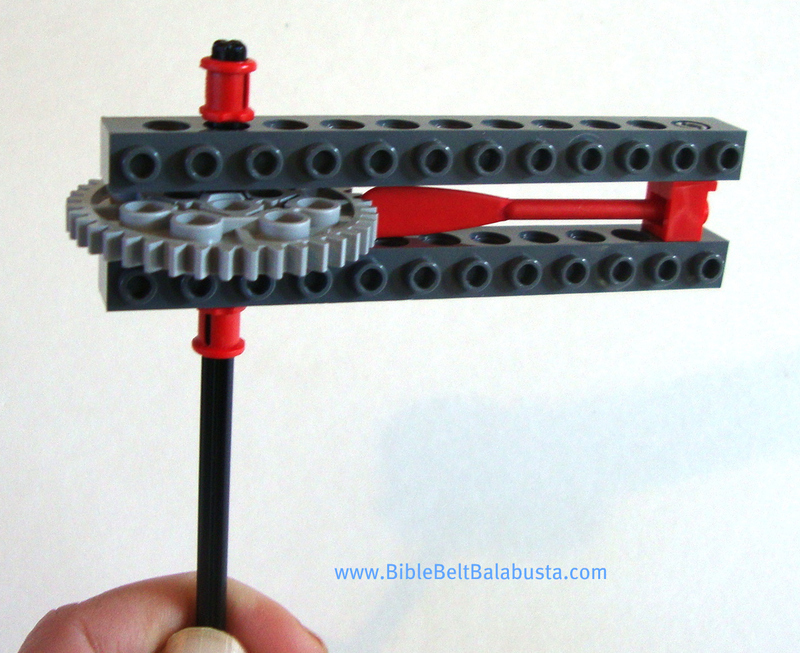 What are the pieces for the lego gragger? My son would really like to put the set together. Thanks for calling my attention to the fact that I had not added the DIY link to the Jewish Lego page. Fixed, now. Thank you very much for you response. My kids would like to make the gragger with the oar. They dont like the rubber band idea I tried convincing them otherwise but did not work. I would like to try and make that happen. Can you please email me the specs for that one. I would greatlly appreciate it.